Have you ever got a static electricity shock? Or seen sparks when you take off your jumper? Well, lightning follows the same principle, but on a much bigger scale. Lightning is an electric current. To make this electric current, first you need a cloud. When the ground is hot, it heats the air above it. This warm air rises. As the air rises, water vapour cools and forms a cloud. When air continues to rise, the cloud gets bigger and bigger. In the tops of the clouds, temperature is below freezing and the water vapour turns into ice. The cloud then becomes a thundercloud. Lots of small bits of ice bump into each other as they move around. All these collisions cause a buildup of electrical charge. Eventually, the whole cloud fills up with electrical charges. Lighter, positively charged particles form at the top of the cloud. Heavier, negatively charged particles sink to the bottom of the cloud. When the positive and negative charges grow large enough, a giant spark – lightning – occurs between the two charges within the cloud. This is like a static electricity sparks that you see, but much bigger. Most lightning happens inside a cloud, but sometimes it happens between the cloud and the ground. Charged particles arriving from the sun, such as protons are normally trapped by the Magnetic Field that fills the Thermosphere layer some 100 to 800 km (62 to 100 miles) above sea level. As explained in Earth Temperature link the protons do not remain still but spiral along the Magnetic Field Force lines moving between the two Magnetic Poles. The collapse of the Magnetic Field in the western and southern hemispheres by an average of 10% between the years 1850 and 2000, half of which occurred between the years 1970 and 2000 alone, indicates an accelerated downfall of the Magnetic Field. While some protons get trapped in the Thermosphere layer, others find it easier to penetrate the weaker Magnetic Field to reach the Troposphere layer where weather, major wind systems, and cloud formations mostly occur and extends from sea level up to 17 km (10 miles) above sea level. The Sun ejects from time to time big chunks of mass and energy, that we call Coronal Mass Ejection (CME). Some of these sudden CMEs could fire their way in the direction of Earth at random. The penetration of sudden swamps of positively charged, high-speed, protons into the negatively charged, low-speed electrons filling the bottom of clouds, generate micro bolts of lightning on sub-atomic level. The grumbles and growls we hear as strange sounds and roar from the sky do actually come from the rapid expansion of the air surrounding the micro lightning bolts. It is commonly known that protons spiraling along the Magnetic Field Force lines, moving between the two magnetic poles, will have to come closer to Earth’s surface as they enter into the Troposphere layer at the Magnetic Poles sites, thus creating the Aurora Borealis lights. It was researched most recently that they also generate sky sounds at close proximity to the Earth’s surface http://www.aalto.fi/en/current/news/view/2012-07-09/ . In a nutshell, the protons penetrating the Troposphere, whether along the Magnetic Field Force lines at the Magnetic Poles or through the Magnetic Field Force lines, at a region spot that happen to fall in the path of a Sun mild CMEs produce sky sounds as observed lately in many parts of the world. Just before midnight on new year’s eve of 2011, anywhere from 1,000 to 5,000 red-winged blackbirds and starlings fell from the sky within a one-mile area over the town of Beebe, Arkansas. Recently, a mass fish kill, in which an estimated 100,000 drum fish washed up on a twenty-mile stretch near the town of Ozark, Arkansas, which is about 200 km (125 miles) away from Beebe. And then, around 500 red-winged blackbirds, starlings, and grackles fell to their deaths over a quarter-mile stretch of highway near Labarre, Louisiana, which is 576 km (360 miles) from Beebe and 720 km (450 miles) from Ozark. At the same time, hundreds of what were most likely jackdaws fell to the ground all over Falköping, Sweden! The increase of protons reaching the surface of the Earth results in increasing cases of depression and cancer risks, damage to central nervous system and cataracts as well as other diseases. The acute effect of a whole-body proton radiation on the function of leukocyte populations in the spleen and blood were examined in small mass animals. Adult female mice were exposed to a single dose (3 Gy , where Gy is Gray or unit of Radiation) of protons and were killed humanely at six different times thereafter. A typical schedule of treatment of human cancer via radiation for adults, for comparison, is 1.8 to 2 Gy per day, five days a week. I tend to believe that the events of sudden death of Birds and Fish in the recent years could very well be attributed to the damage of their central nervous system due to being exposed to high doses of protons radiation at the time of sudden CMEs mass and energy reaching Earth. Charged particles arriving from the Sun are trapped along the Magnetic Field Force lines. The continuous weakening of Earth Magnetic field allows a percentage of such charged particles, namely protons, not to get trapped and to penetrate into the Troposphere layer where most air travel takes place. As a result, increased proton levels at the surface of Earth has been detected in recent years. Additional doses of protons are also detected and are mostly associated with mild to strong CMEs that randomly fire from the Sun towards of Earth. The rush of such additional protons, at little instants, leads to increased penetration into the magnetic field and arrival to the Troposphere of instant surges of positively charged electric particles. Jet airliners used to employ Aluminum as the main material in their primary structure including the fuselage. Carbon composites material is introduced lately into the composition of the structure of jet airliners. It is well-known that Aluminum enjoys 1,000 fold better conductivity than Carbon composites. The decrease of Aluminum and increase of Carbon composites into the structure of jet planes bring the fuselage to become less conductive and less able to electrically ground the arrival of surges of charged particles, which happen to intersect the path of a plane at random. Fuselage poor conductivity allows charged protons to penetrate into the main cabin. This could cause increased radiation doses as well as the possibility to damaging electronic circuits and electric batteries; causing fire! This analysis still requires further and elaborate tests and coordination. 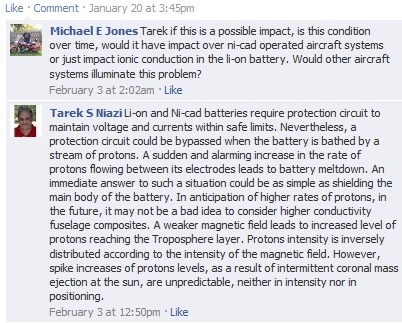 On January 17th 2013 and in an effort to help close on the melting battery issue of the Boeing 787 Dreamliner, I wrote at the airliner reporter site the following and I quote: “Charged particles arriving from the Sun are trapped along the magnetic field force lines. The continuous weakening of Earth Magnetic field allows a percentage of such charged particles, namely protons, not to get trapped and to penetrate into the Troposphere layer where most air travel takes place. As a result, increased proton level at the surface of Earth has been detected in recent years. Additional doses of protons are also detected and are mostly associated with mild-to-strong Coronal Mass Ejections (CMEs) that randomly fire from the Sun and happens to flow towards Earth. The rush of such additional protons, at small instants, leads to an increased penetration through the magnetic field and arrival to the Troposphere of instant surges of positively charged electric particles. Jet airliners used to employ Aluminum as the main material in their primary structure including the fuselage. Carbon composites material is introduced lately into the composition of the structure of jet airliners. It is commonly known that Aluminum provides 1,000 fold better conductivity than Carbon composites. The decrease of Aluminum and increase of Carbon composites into the structure of jet airliners lead the fuselage to become less conductive and less able to electrically ground the arrival of a random surge of charged particles. Fuselage poor conductivity allows charged protons to penetrate into the main cabin. This could cause increased radiation doses as well as the possibility to damaging electronic circuits and electric batteries; causing fire! This analysis still requires further and elaborate tests and coordination”. On April 22nd 2013 and April 28th 2013, the BBC News and Wall Street Journal News quoted the Dreamliner’s team as they found a fix to the melting battery issue. As stated, the fix matches the fix that I suggested back in January/February 2013 onto the airliner reporter site and the Dreamliner’s facebook page. I quote from the news: “The grounding kicked off a scramble by Boeing to investigate what had gone wrong. The company developed a new containment enclosure, venting system and other modifications to the battery systems but was unable to identify the cause of the incidents”. It seems that the reason of the problem is still being investigated by the Dreamliner’s team and I believe they will eventually come to terms with the root-cause analysis that I put to them in the early months of 2013 as I quoted above. In fact, back in 2009, I suggested in my book “More Than 60 Minutes” conductive enclosures onto all mission critical electric apparatuses to ground the bathing of protons and electrons which are increasing and are expected to escalate as the magnetic field keeps losing some of its magnetic force lines. It is only when I understood the relation between the continuous weakening of the magnetic field and the gradual increase of protons level on the surface of Earth as well as sudden surges of CMEs charged particles bathing into our atmosphere, that I became able to recommend shielding the battery by a conducting material to prevent protons charge and consequent battery melting and fire. A Coronal Mass Ejection on the surface of the sun, if by chance happen to fire towards Earth, brings a sudden rush of charged particles. The continuous and rapid weakening of the magnetic field, means that more of such protons are able to penetrate the Thermosphere layer and make it to the surface of Earth. Exposure of humans to such sudden rush of protons could have produced similar symptoms to treatment of human cancer via radiation. Symptoms such as Vomiting and Diarrhea are common symptoms to humans under treatment by radiation. This could very well explain what happened to the 600 passengers and crew members of the Royal Caribbean cruise on January 27th 2014. In spite of recurring sanitization of the ship, that incident keeps repeating at random over the past few years. The cause of the illness was not immediately clear, though symptoms are consistent with neuro-virus, the cruise line said! It is worth investigating if those 600 passengers and crew members were on deck at the time they started experiencing Vomiting and Diarrhea. Being inside cabins and ship halls could have protected other passengers, since the metal structure of the ship would have shielded rushed protons and kept indoor passengers safe. If the Earth magnetic field does not get any weaker, I expect frequent occurrence of similar incidents especially mid way between the magnetic poles where the magnetic field is weakest. However, if the magnetic field keeps getting weaker due to bonding of more of its Magnetic Field Force lines with the Magnetic Field Force lines of a ninth planet or Tyche, as NASA called it, then I expect more occurrences of such incidents to emerge at sea and on land.